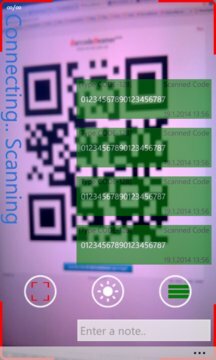 BarcodeBeamer is the fastest, the most reliable, and the most feature rich barcode scanner and QR code reader for your mobile phone! BarcodeBeamer also has premium connectivity features for beaming up those scanned codes to your computer! Open BarcodeBeamer and point the camera at the code so that the image looks sharp - code is read automatically. That's all folks! Note! The focus is preset to a very short distance for quick scanning - no need to wait autofocus. (if the phone supports it). 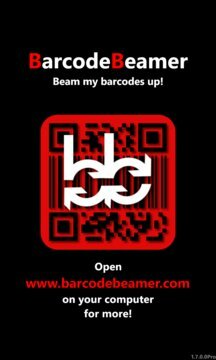 Go to www.barcodebeamer.com with a relatively new browser, scan the on-screen code with BarcodeBeamer app and start beaming codes to your computer! ..or download BarcodeBeamer for Windows to use BarcodeBeamer as a barcode scanner for your computer directly! Share the scanned codes via SMS, email, and social networks directly from the app. Advanced users can configure BarcodeBeamer to beam the scanned codes directly to a web service. Our connections are encrypted and we're not storing any of your beamed codes on our servers. * For longer barcodes turn the phone horizontally so the code fits the screen better. * Tap or tap & hold the scanned codes on screen to open additional menus. * The focus is preset to a very short distance for quick scanning (if the phone supports it). * Tap a free area on the screen and the camera will focus there. * Press the phone's camera button to autofocus the camera to the center of the screen. * If you're using a phone without a flash, make sure there's enough light. * Navigate between scanner and internal browser with quick swiping, or flicking, the screen. Please report all issues to contact@barcodebeamer.com so we can fix them together - yes we can! As an independent developer it's almost impossible to verify the functionality in every scenario so user activity is needed sometimes.